Fresh, natural appearance texture, hard, durable, light weight, biodegradable and eco friendly. Measures 12 by 9 inches, works well for cutting and serving. Beyond Amazon's A-Z claim policy, you are backed by Surpahs 100% satisfaction guarantee policy. 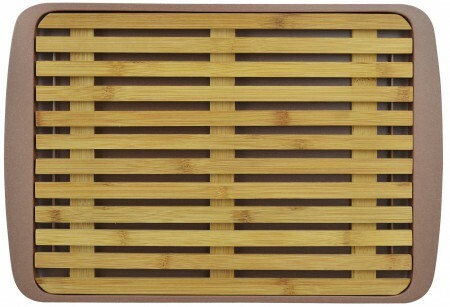 100% Natural bamboo made cutting mat with Eco-friendly bamboo fiber made removable crumb catcher. Great for cutting your artisan breads.